With three freshmen university students on our team, we decided to focus on a solution to a problem that personally impacted us. One thing we struggled with at the beginning of university was managing all the different websites that the university professors used, remembering to check the websites for updates and easily keeping track of upcoming assignments. We decided to create a hack that would make our lives, and the lives of other students, much easier to manage by having all assignments in one place which could be easily accessed. We wanted to make something interactive and thought that using the Google Home Mini and its speaker capabilities would be the best option. Thus, the idea for UNI-te was born. 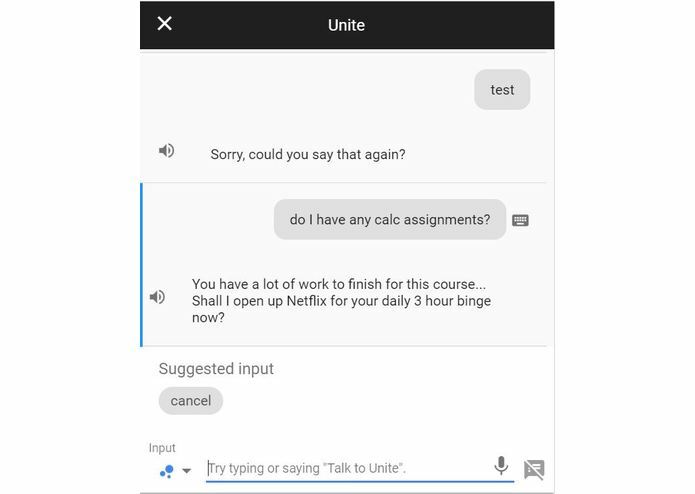 UNI-te is a combination of Google Assistant and Google Firebase, where we also use Google Cloud Functions. 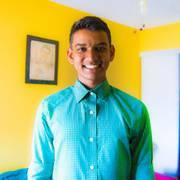 It scrapes the various university websites, such as LEARN, for assignments and classes, and compiles them all into Firebase, storing them in Cloud Storage. It then accesses the Firebase data using DialogFlow, where it has intents that the user could want, and uses the data to respond accordingly. We use Google Assistant on a Google Home Mini to provide an interactive voice experience. This makes it more natural to use in a residence (on campus) or any bedroom environment. We learned how Google Assistant’s Actions work and how to create intents, entities and fulfilment. It was also interesting to learn how Google services compliment each other in order to expand their capabilities. We would like to create chained intents to make using the Google Assistant more like a realistic support service. If possible, we would also like to customize the voice of UNI-te to correspond with the gender of the person using it. Finally, we would like to incorporate supported third-party software such as Slack into UNI-te to expand its functionalities (e.g. team tasks with Slack). I worked on connecting the intents from Google's Dialogflow to our Firebase database. Created fulfillments to retrieve user data based on complex queries. I worked on creating the various intents and entities included in the project and added them to DialogFlow. I also helped to debug the fulfillment code and ran various tests to ensure that the Assistant was responding correctly. I worked on fetching the data from the universities website by scraping it and sending it to the firebase database.